In recent times with the coming up of the age of ePub standards, there has been a substantial increase in the use of enhanced ePub. These services have been designed to give a significant advantage to readers to read through the text easily and also the advantage to read the books in popular digital formats and without going for any kind of secondary conversions. Our services also involve adding interactive and enhanced features to the eBooks to enhance the reading experience of the targeted users. To increase the appeal of the eBooks, we add interactive pictures, texts, quizzes, assessments, charts, diagrams, audios, and videos to various children books, educational or academic books, travel books or guides, photography books, health or medical books, etc. We go through a very advanced process to induce creativity and engagement to your ebook content. The process starts by targeting a certain audience and knowing how to reach them. Once the target is set, we make sure to optimize the content so that it can be viewed on a majority of devices with different screen dimensions, especially on mobile phones. For this, we can help you choose a layout that correctly matches your business needs. Finally, we can carry out the end to end process like designing eBook cover, ebook formatting, and proofreading before publishing it online. Outsourcing your requirements will ensure high-quality services from our outsourcing team. Our dedicated and quality oriented enhanced ePub conversion services in India have been exclusively designed and developed to meet the requirements of businesses and meet the purpose. We put a competitive price tagging and this gives us the leading edge to serve the publishers and clients with advantage and excitement. We maintain and implement time-bound strategies that will make us deliver the final work in time. We take advantage of our enhanced ebook conversions for all types of standard electronic publications. Experts in our office are ready to accept format sources like MS Word, PDF, Quark, RTF, XML, HTML and other media to convert into digital publications and books which is usable on any device. Since the advantage is in the open standard format, consumers’ interoperability is offered in ePUB between software and hardware. We meet the requirements of our clients to give services such as XML, and application files extractable PDF and many more. The services offered by professionals in our office are flexible in terms of format and are designed to meet our client’s customized page view, style of text and display requirements. At PGBS, our experts are committed to providing accurate and precise enhanced conversion apart from the automated package creation and validation. 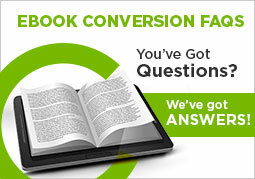 Our expertise in eBooks conversion for Apple iBooks is an advantage and has helped to add value. We are dedicated to offer you quality digital conversion solutions. You can get a no obligation quote from us for any of your digitization requirements. Contact us today! With adequate technology driven automated processes, as an established enhanced ePub conversion services provider, we are invigorated with the right technician infrastructure and trained professionals to meet even the most arduous enhanced ePub conversion requirements of clients from different industry verticals.